The guys at the Korilla BBQ truck. I don’t know who the genius was who thought up the (altogether logical) fusion of Korean BBQ and Mexican food, but I am glad that the trend has exploded. I’d been trying to get to the Korilla BBQ truck for some time, but unfortunately, they’ve always been parked way out of my lunch neighborhood (Midtown west). Finally, though, they said they’d be parked on 57th and 9th and even though that’s a good hoof on a cold day I thought I had to give it a try. As it turned out, my officemates were also interested, so we put together a large order and had a chance to sample a variety of their wares. 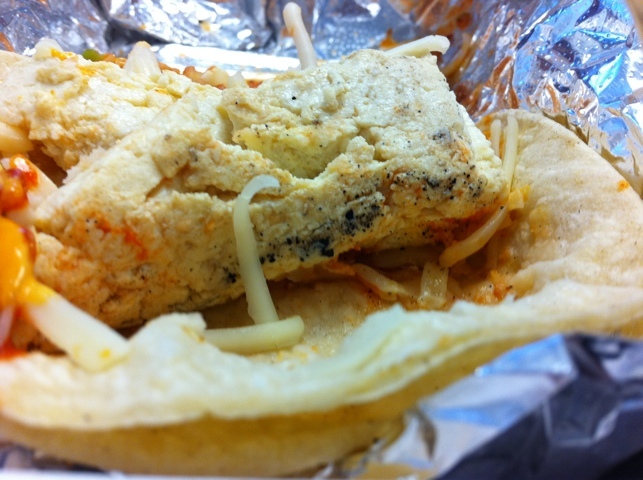 I ordered tofu tacos, pork tacos and a beef burrito. I am afraid our experience was a mixed bag. Umm... what is that mysterios black vein in the tofu? Yuck. My colleague Nicola wanted the tofu. She said she immediately felt ill when she bit into them. However, that didn’t stop her from consuming two of the tacos. She was thwarted at the third when she noticed a peculiar dark vein running through her tofu. We have no idea what this is, or what caused it. Ultimately, it rendered them “indedible” according to her and she sent a Twitpic to the Korilla folks to ask them WTF. That's what's on the inside of the pork taco, sauce and all. My colleague Matt and I split the burrito and pork tacos, with happier results. The pork tacos were spicy and were served with a long slice of pickle in them. The quality of the pork wasn’t as good as what I’ve had elsewhere (Korean Pro, or even Bann Next Door). They were served with a kimchi slaw, cheese and bbq sauce. A huge problem with them, though, was that they were lamentably ice cold by the time they landed on my desk – the truck was several blocks away. This could be perhaps remedied if they used a less eco-friendly container (recycled paper stock) in favor of plastic or styrofoam, but who needs that on their conscience? 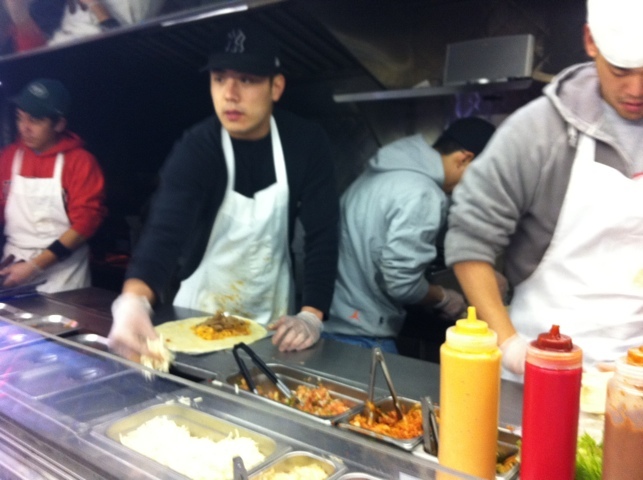 The pork tacos, while spicy, were nowhere near as hot as those from Pro hot, which caused me to break a sweat. 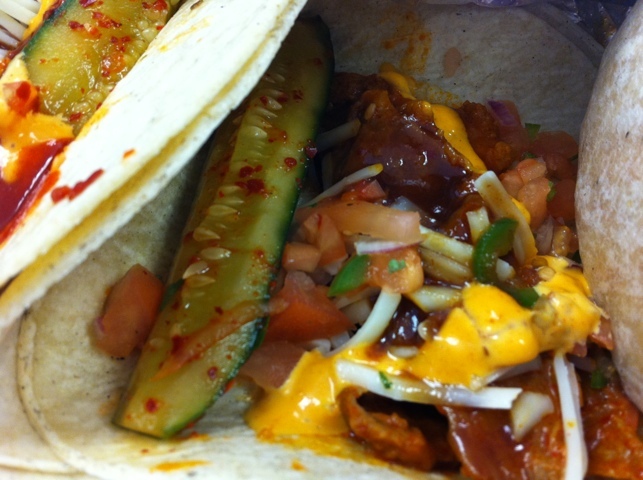 A closer look at the beef bulgogi burrito. The star of the show was the beef bulgogi burrito. It’s a rather large portion of food, served with bacon & kimchi fried rice, red kimchi, their “korilla sauce” (a spicy mayo), shredded jack cheese, salsa and a big fat leaf of red leaf lettuce. Again, it was cold by the time it hit my desk. Despite that, it was still very very good. The lettuce leaf and kimchi really add a fresh note and texture that reminds you you’re eating Korean food. There’s a sour in the flavor courtesy of all the pickled vegetables, but I confess my mouth was still a bit on fire from the spicy pork tacos. Underlying the heat is a smoky sweetness to the steak. I’m concerned about what happened to Nicola’s tofu. FYI – they responded quickly to her WTF tweet and replaced her wonky taco with a tofu burrito. 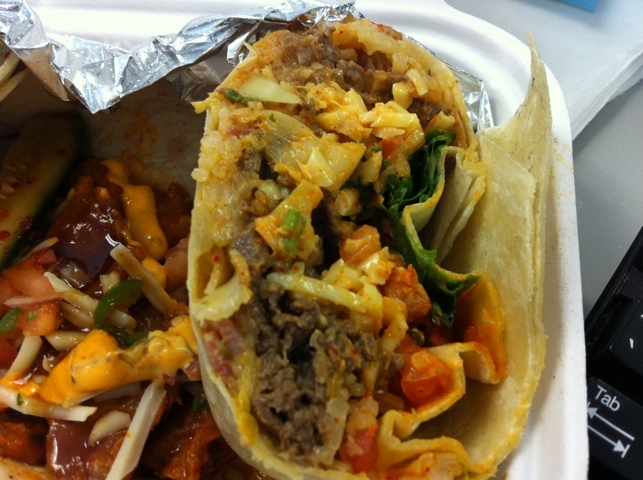 As a meat-eater I’ll be glad to go back and give the beef bulgogi burrito another try. I think I’ll skip the pork.